One of our favorite annual events during the holiday season actually does not have anything to do with Christmas or any of those sorta-religious-but-really-mostly-commercial holidays. Nope, it’s a straight-up throwback to the Druid days, when the Winter Solstice was a celebrated event. This year the shortest day/longest night of the calendar falls upon December 22, or as you might know it, this coming Tuesday. So round up some pagans and get ready for all that darkness by heading over to Canteen Brewhouse for the always wonderful Solstice Blackout. This sampler tray of dark beers has always been a favorite of ours. Heck, last year we even brewed a Baltic Porter for it. We were not able to do that this year, but Canteen will still have a lineup that includes Sweet Sandarine Porter, Schwartzbier, Black Hops IPA, Dark & Lusty Stout, and the epic Panama Joe Coffee Stout. Well, that was what was listed for their last mug club meeting a while back, but we are guessing that will be the final lineup. But wait, that is not all! Tractor will be unleashing another of our annual favorites, the Luna De Los Muertos Russian Imperial Stout, on Tuesday as well. I got an advance pint of this obsidian masterpiece and it certainly lives up to past incarnations. Of course, for those who think Tuesday is way too far away, fear not, because Boese Brothers will satiate you on Saturday with the release of their Barrel-Aged Porter. Yup, it’s their first barrel-aged beer, so that alone is worth checking out. There will be a live DJ, an ugly sweater contest, and a lineup of smoked holiday-themed foods from Gold Street Caffe. It all starts from the moment they open the doors and will conclude when they close. Beyond those, there are a few other new beers worth checking out around town, too. Bistronomy B2B flipped around the beer menu quite a bit with fresh batches of House IPA, Brown Ale, Cerveza Chile Verde, Galaxy Pale Ale, and Very Chai Christmas. Boxing Bear is going the single-hop route with a Crystal S.M.A.S.H. Marble has Imperial Red back on tap at both locations. Up in Santa Fe, Blue Corn is channeling some Bad Religion with Stranger Than Fiction, a Belgian-style IPA. Continue reading for all the news that is fit to blog for the week of December 14. Beers: House IPA, Cherry Stout, Coconut Porter, Raz Wheat, Red Rye, Brown Ale, Rye Noon, Very Chai Christmas, Cerveza Chile Verde (B2B only), Galaxy Pale Ale (Lobo only), Pepper Saison (Lobo only). At long last, we have a list for B2B and their sister location, Lobo Beast. They rotate through beers quickly, so if you see one you have to try off this list, hurry over. As proof, the lineup shifted significantly. The freshest additions are the House IPA, Brown Ale, Very Chai Christmas, Cerveza Chile Verde, and Galaxy Pale Ale. See our intro for all the info you need on Saturday’s all-day Barrel-Aged Porter Release Party. Beers: Humo Rojo, Olde Bosky Porter, Belgian Blonde, Jared’s Belgian Quad with cherries, Eldorado Pale Ale, Jingle Bell Bock (Nob Hill only), Imperial Coffee Brown (on nitro). All three Bosque locations are now up to date. The new Belgian ale series is underway with the Belgian Blonde (7.3% ABV, 24 IBU), plus the Jared’s Quad with cherries. An old favorite has returned in the Olde Bosky Porter (6% ABV, 27 IBU), an original member of the lineup that cries out for a return to your bellies. Still available is the Humo Rojo (5.6% ABV, 16 IBU), a smoked red ale. The Eldorado Pale Ale is a delicious, single-hop pale. The new Jingle Bell Bock is a sweet treat. The Imperial Coffee Brown is also for sale in bombers; we highly, highly recommend you pick up this one before it’s gone. You can still buy bombers of the barrel-aged Jet Black Winter (10.2% ABV) until the supply runs out. Beers: Noble Pale Ale, Body Slam Imperial Pilsner, Fist Pump Pumpkin Ale, Chocolate Milk Stout, Red Glove, Bear-El Aged Stout, Crystal S.M.A.S.H. Boxing Bear got into the barrel-aging game by taking some Standing 8 Stout and putting it in Pinot Noir barrels. Go try this rather different take on a barrel-aged offering while it lasts. Get your hop thirst quenched with the new Red Glove (7.4% ABV, 90 IBU). The Chocolate Milk Stout (5.2% ABV, 20 IBU), a silver medal winner at GABF this fall, is back for another run. You can expect it to go fast, again, so head over ASAP. Is also available on nitro while supplies last, plus now they have bottled it and bombers are for sale at the brewery. Other available seasonals include the Fist Pump (5.4% ABV, 20 IBU), Noble PA (5.8% ABV, 30 IBU), and Body Slam (7.4% ABV, 60 IBU). Beers: Irish Red, Canteen Calabaza, Cherry Blossom Wheat, Sasquatch Scotch, Galaxy IPA, Aumbers Amber. The Galaxy IPA (7.2% ABV, 80 IBU) will take you out of this world. The Cherry Blossom Wheat (4% ABV, 10 IBU) was made with 100-percent tart cherry puree, and it offers a nice break from the heavier beers on tap. An old favorite is back in the Sasquatch (8% ABV, 26 IBU). The Calabaza (6.8% ABV, 24 IBU) is Canteen’s take on a pumpkin ale. The Aumbers (6.5% ABV, 45 IBU) offers up more of a kick than most ambers. Events: Live music is back this week with Dusty Low performing Sunday at 3 p.m., followed by Russell James Pyle on Tuesday at 6 p.m. Beers: Radioactive IPA, El Guero White IPA, Bambina Milk Stout, Juniper Berry Braggot. The most recent additions are the El Guero and the Braggot (9% ABV), the latter of which is a hybrid of a beer and a mead. Before that came the hop-tastic Radioactive and smooth-as-silk Bambina. Take note, the Smoke ’em Out is still on tap for a limited time at the Microbar downtown. Events: The Desert Darlings belly dancers perform from 6 to 8 p.m. on almost every Sunday. If you’ve never seen the Desert Darlings in person, you’re missing out. They will be taking the holidays off, so we will let you know when their shows resume. In the meantime, go to their Facebook page to get all the info to this weekend’s special show, Nightmare: A Theatrical Belly Dance Adventure, in Santa Fe. Events: Funk Tractor performs on Saturday from 7 to 10 p.m. Yoga is back at the taproom every Sunday at 10:45 a.m. 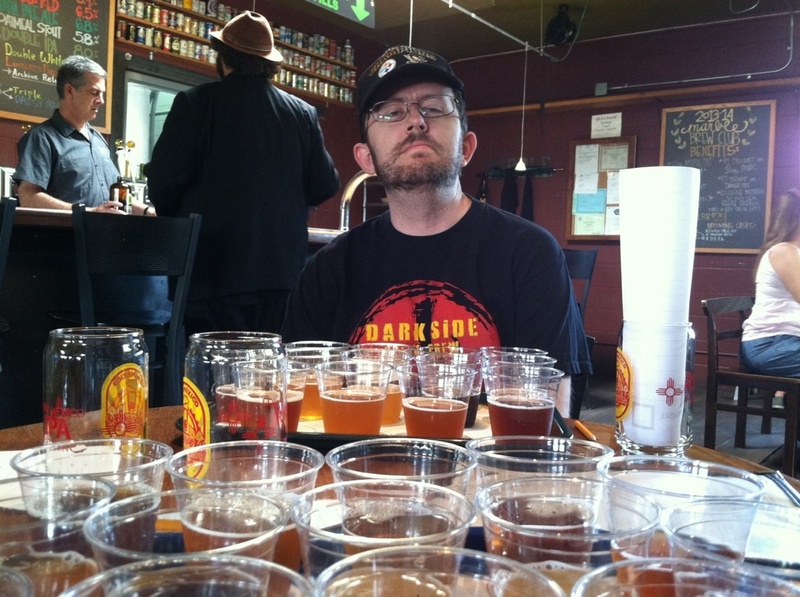 Beers: Tall, Dark, and Pumpkin, Hey Porter, Reserve Ale, Imperial Red. Head over to either Marble location fast before the Tall, Dark, and Pumpkin (6.2% ABV) runs out. Remember how fast the last two Marble pumpkin ales went? Exactly. The TDP is a brown ale with pumpkin spice and vanilla, served on nitro. Also available at both locations is the delectable Hey Porter (5.9% ABV). Two heavyweights, the Reserve and Imperial Red, are back on tap. All beers are available at both locations for the time being. On the live music front, Na’an Stop will take the stage Saturday from 6 to 9 p.m. Beers: Equinox, Hoppy Wheat, U.S.S. Simcoe. The U.S.S. Simcoe (7% ABV, 30 IBU) is the latest pale ale in Nexus’ S.M.A.S.H. (single malt and single hop) series, and it is a tasty one. Equinox (6.5% ABV, 16 IBU) is back for another run of pumpkin-spiced brown ale goodness. This year’s version wowed us all at NM Brew Fest. The Hoppy Wheat is a seasonal hopped-up wheat beer, as if you could not guess by the name. Events: On the live music front, Watermelon Mountain Jug Band performs tonight (Wednesday) at 5 p.m. Lenin & McCarthy follow on Thursday at 7 p.m. Friday will feature a doubleheader with Nathan Payne & the Wild Bores at 4 p.m., followed by the Chuck Hawley Group at 6. Stratus Phear will hit the stage Saturday at 6 p.m. Beers: Berliner Weisse, Dark Horse Lager, Desert Dweller IPA, Barn Burner Pale Ale, Turkey Drool, Pear Berry Cider, Tupac Cali Red, Barnstorm Ale, Et Tu Brute Cider (Wells Park only), Scotcholate Scotch Ale (Wells Park only), Summer Ale (Wells Park only), Lil Cease Session IPA (Nob Hill only), The Ruggles (Nob Hill only). The newest additions are the Et Tu Brute Cider and Scotcholate Scotch Ale (at Wells Park only) and the Tupac Cali Red (6.5% ABV, 80 IBU) and Barnstorm Ale at both locations. Before that came the Turkey Drool (8.3% ABV, 30 IBU), Desert Dweller (6% ABV), and Lil’ Cease Session IPA (4.5% ABV, 79 IBU). This year’s Turkey Drool might be the best yet, a perfectly balanced blend of amazing flavors, sweet, smooth, and spicy all in one glass. Still hanging around are the Dark Horse Lager (5.6% ABV) and Summer Ale (7% ABV). The Ruggles (4.4% ABV) is a California Common-style beer. Berliner Weisse (5.1% ABV) is still available at both locations. Events: Kamikaze Karaoke is back tonight (Wednesday) at Wells Park starting at 7 p.m. Or you can head up to Nob Hill for Solos on the Hill, featuring Alex Maryol at 8:30 p.m. The Thirsty Thursday Music Series is back at Wells Park as Eryn Bent performs at 8 p.m. She will be followed by the 3rd Thursdays Comedy Contest at 10 p.m.
Emily Davis performs at Wells Park on Friday at 8 p.m.
Saturday will feature the In the Mix series with Homegirls Records spinning at 9 p.m. at Wells Park. Earlier at Nob Hill, the Setting the Tone series features Meredith Wilder starts at 5 p.m. Beers: Black IPA, Chicken Killer, Santa Fe Gold, Belgian Dubbel (ECS), Adobe Igloo 2.0 (Winter Warmer), La Bete Noire. The fourth entry in the ECS (Ever Changing Series) is now available on tap and in bombers in the form of Belgian Dubbel. The Santa Fe Gold is now for sale all around the state in six-packs. The Adobe Igloo 2.0, an improved, spiced winter warmer, is now available on tap. The most recent addition is La Bete Noire, a black saison. The 12 Beers of Christmas continue this week at both the main brewery taproom and the ABQ taproom. For those who don’t know about this annual event, SFBC creates a dozen small batch beers and releases them one at a time from Dec. 12-23. That remaining order is Elephant’s Wit Jungle Bells (today), B’s Nuts Roasting on an Open Fire (Thursday), I’m Dreaming of a Wit Christmas (Friday), Drunkel Stiltskin (Saturday), Master T Bates’ Oregano IPA (Sunday), Grandpa’s Merry Grundler (Monday), Black as Coal Porter (Tuesday), Last Minute Shopping (next Wednesday). And no, we have no idea what kind of beer the last one is. Beers: Kolsch, IPA, Cream Stout, Rauchbier, International Style Pale Ale, Kidder Special Bitter, St. George IPA, 2015 Anniversary Ale, 2015 Anniversary ESB. Hurry over to try the two beers that were brewed up for last weekend’s 19th anniversary, a hoppy ale and an ESB. The St. George and Kidder are two old favorites back on tap. The Pivotal IPA and Boneshaker Bitter are often available for purchase in four-packs of cans. Events: On the live music front, Ornetcetera performs Friday and the Bill Hearne Trio is back on Saturday at the original location. The Railyard will play host to Les Gens Bruyants on Friday and Mystic Lizard on Saturday.